Long Runs are Longer When You’re Lost. Today’s run was supposed to be a long one. 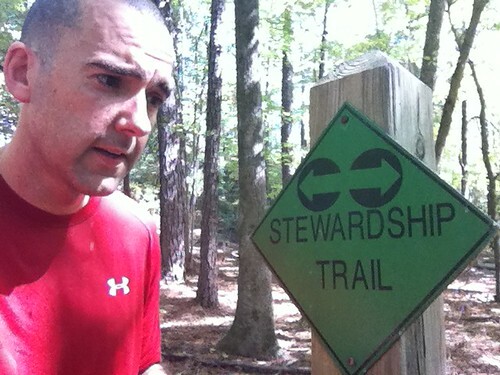 I was shooting for 8 or 9 miles in the Harbison State Forest. The good news is that I succeeded in making the distance. The bad news is that my route was nothing like what I had planned. I was lost, several times, in the woods, alone. The plan was for Cara to take Dublin (our pug) to the forest for a while and pick me up later. I had things planned out pretty well. I had a color printout of the official trail map, my Garmin GPS watch, my iPhone and a bottle of water. Things were pretty good for a while, and I even tweeted happily about where I was. Things seemed a little better when I found the River Rest Stop. It’s about 100 yards off of the Stewardship Trail. There are some benches, and if you’re willing to walk through a little brush then you can get to the Broad River. I walked down to a nice flat rock and sat down on a log to do some tweeting and send a few pics to Flickr and post a vid on YouTube about the area. The moral of this story is simple. iPhone maps aren’t all that useful in the middle of the damned woods. Just use a paper map, look at signs and ask people for directions like we all used to do in the Olden Days.